When choosing the flooring shade for your home, you may have your heart set on light shades that will make any space feel larger and brighter. The good news is that you don’t have to settle for white carpet when you want to give your space an airy, modern feel. There are several different light colored options available in natural stone, and every one of them will make your home stand out and attract attention. Here are the top five marble floors that come in lighter shades you’re sure to love. If your motto is to go big or go home, then Calacatta Gold marble is sure to please you. This natural stone does come with a higher price point, but you can save on it by taking advantage of wholesale pricing. The stones have a white background with touches of gold and silver veining flowing across them. The movement in these stones makes them stand out, and they will add visual interest to any space. Use them on floors that will largely be open and unadorned with furniture or carpets, including your foyer, the kitchen, and especially in the bathroom. The bold colorful veining adds visual appeal and gives every room its own unique look. You can use this light colored tile on the floors and then add wonderful bold accents to the walls and windows in order to bring out the natural shading in these stones. Nalboor Tiles offers Calacatta Gold marble in 12” and 18” squares. You can also order a free sample to see how these high-end stone tiles can give your build a fresh new look and boost the value. Breccia Oniciata marble features shades of hazel, salmon, and brown so that you can bring these beautiful earth tones to your living room or sleeping areas. The shades ebb and flow across the tile for visual interest and a stunning look, yet it all blends together in one light tan shade from a distance. This is why Breccia Oniciata is a popular choice for living rooms and dens. You can add interest to the floor while still keeping the main focus on your overall décor and furniture. This type of marble is commonly replicated in vinyl and ceramic options, but you can enjoy the real thing thanks to our wholesale pricing. When you want the movement of natural stone veining along with subtle color changes, these tiles are sure to please you. The shades are light enough to visually enlarge any room, and the color variation is close enough that you’ll get a beautiful soft finish without feeling overwhelmed by it. When you choose these tiles, you can skip the area rugs and just let the elegant look of Breccia Oniciata shine through. When you think of marble statues, you probably envision the typical white marble with slim grey veins. In addition to offering a range of unique marbles, Nalboor Tiles also carries Statuario Venatino marble tiles in 12” and 18” squares. The dark grey veining shows up prominently in this tile, and it’s commonly seen as shower walls. However, this tile also looks great on floors. You can use it to make your modern kitchen more impressive or add interest to your bedroom floor. You may prefer to use this tile in open areas where you need to fill in some space, such as your foyer or hallways, but it can also look incredible in a small bathroom or your formal dining room. If you love the look of wood but want the durability of marble, then White Wood Gray marble tiles are the best choice for your home. These tiles come in rectangular shapes ranging from 12 x 24” to 24 x 48”. They’ll give your home a fresh new style while adding a light color to the floors. Perfect for every space in your home, they can be used in areas where wood floors typically won’t work. Install the tiles in your basement for a waterproof floor, or use them in the bathroom so you can have the look of white wood without the hassle. Your clients will love the unique finish, and your own family will love the updated style. These tiles also have a lower cost-per-square-foot, so you can keep the overall bill down. We offer discount, bulk-rate pricing so that you can save on your project. This is a great opportunity to lighten up your home while making it easier to care for. 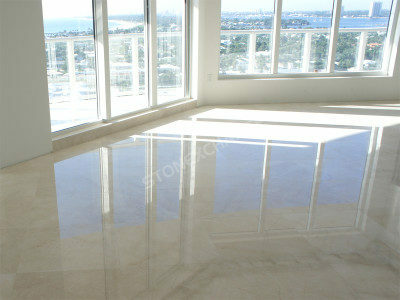 When you want a basic white floor that’s easy on the budget, go with Crema Marfil marble. This elegant stone has a solid ivory background with light veining in shades of yellow, gold, and red. From a distance, the floor will look white without feeling stark. Only when you get up closer will you see the movement and flow of the contrasting veins. These tiles can be used in all types of applications, and they’re perfect for residential and commercial settings. The neutral finish makes them a great border to traditional wood floors or contrasting marble tiles. They have enough visual interest to be used alone in a room, or you can pair the tiles with an attractive area rug. Whether you’re dreaming of a high-end marble or just want a basic light-colored floor that will withstand the kids and pets, we have what you’re looking for. Nalboor Tiles offers high-quality tiles at wholesale prices, and we’re happy to work directly with the general public. Contractors appreciate our great rates and quick responses, and homeowners can also enjoy great savings when they shop online with us. If you’re ready to place an order and need some help, then call us direct at 305-501-4548.